Reading and share top 14 famous quotes and sayings about Culture And Values by famous authors and people. Browse top 14 famous quotes and sayings about Culture And Values by most favorite authors. 1. "This may seem confusing considering the "swing to the right" this country has taken, but raunch culture transcends elections. The values people vote for are not necessarily the same values they live by. No region of the United States has a higher divorce rate than the Bible Belt." 2. 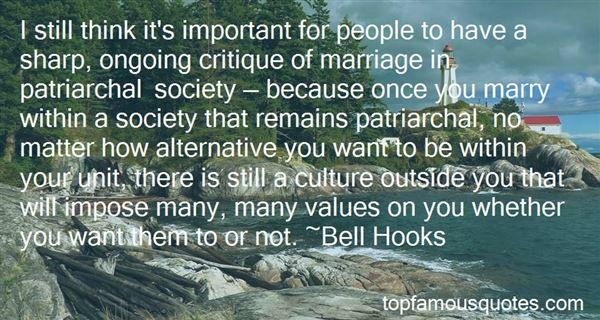 "I still think it's important for people to have a sharp, ongoing critique of marriage in patriarchal society — because once you marry within a society that remains patriarchal, no matter how alternative you want to be within your unit, there is still a culture outside you that will impose many, many values on you whether you want them to or not." 3. "A culture that values production over life values the wrong things, because it will produce things at the expense of living beings, human or otherwise." 4. "When I look at the system here and look at my position - not just as a basketball player, but when I look around me at the values of the people and the culture and compare them with the values of where I came from - I feel so blessed to be from Africa." 5. "My dear young women, with all my heart I urge you not to look to contemporary culture for your role models and mentors. Please look to your faithful mothers for a pattern to follow. Model yourselves after them, not after celebrities whose standards are not the Lord's standards and whose values may not reflect an eternal perspective. Look to your mother." 6. "It is really one of the most serious faults which can be found with the whole conception of democracy, that its cultural function must move on the basis of the common denominator. Such a point of view indeed would make a mess of all of the values which we have developed for examining works of art. 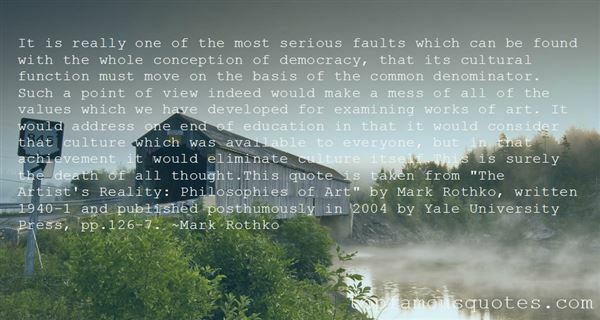 It would address one end of education in that it would consider that culture which was available to everyone, but in that achievement it would eliminate culture itself.This is surely the death of all thought.This quote is taken from "The Artist's Reality: Philosophies of Art" by Mark Rothko, written 1940-1 and published posthumously in 2004 by Yale University Press, pp.126-7." 7. "Design creates culture. Culture shapes values. Values determine the future." 8. "To instill the values for the culture was and is the responsibility of the leadership, and staff alignment was critical to its success. It started with both board and staff. They realized that they needed to share the same value system that says, "I am the equipper, not the doer." If not, there were going to be immense roadblocks to effectively mobilizing people for ministry." 9. "The core symbols we use for God represent what we take to be the highest good....These symbols or images shape our worldview, our ethical system, and our social practice--how we relate to one another.For instance, [Elizabeth A.] Johnson suggests that if a religion speaks about God as warrior, using militaristic language such as how "he crushes his enemies" and summoning people to become soldiers in God's army, then the people tend to become militaristic and aggressive.Likewise, if the key symbol of God is that of a male king (without any balancing feminine imagery), we become a culture that values and enthrones men and masculinity." 10. "Doing less is not being lazy. Don't give in to a culture that values personal sacrifice over personal productivity." 11. "Perhaps because our culture and politics have gone so off course, with values so contrary to those of Jesus, more and more people intuitively recognize that His vision of God's kingdom-a new world of compassion, justice, integrity and peace- is the Good News they've been searching and waiting for." 12. "Your personal core values define who you are, and a company's core values ultimately define the company's character and brand. For individuals, character is destiny. For organizations, culture is destiny." 13. "All of my Polynesian counterparts in the NFL with roots in American Samoa understand how the values embedded in our South Pacific culture - community, hard work, perseverance, respect - contribute directly to our success." 14. "Moralistic culture views government as a positive force, one that values the individual but functions to the benefit of the general public. Discussion of public issues and voting are not only rights but also opportunities to better the individual and society alike. Furthermore, politicians should not profit from their public service." My songs aren't bubble gum pop dance songs and I don't have background dancers on every single song."